Description: These are not photos but actual micro-sculptures carved originally by Olszewski. 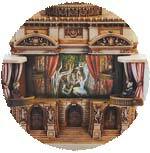 The “Paris Opera House” Luminiart illuminated sculpture was modeled after the opulent Paris Opera House. 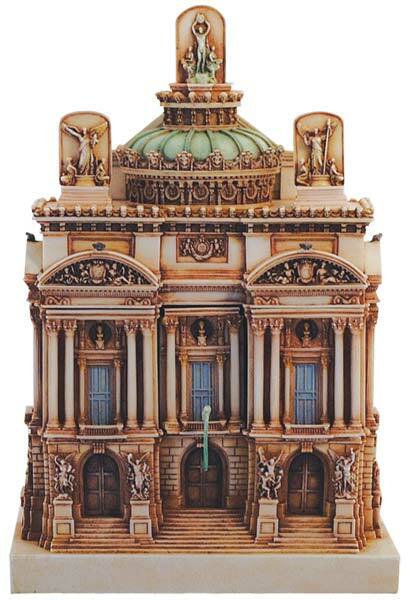 It is not an exact replica, but it is true to the Beaux-Arts beauty of architect Charles Garnier’s masterpiece. Garnier was only 35 years old and relatively unknown when he was awarded the commission. Chosen from among 171 contestants, Garnier began construction in 1861. Fourteen years later, and at a cost of forty-seven million francs, The Paris Opera House opened its doors. The building is vast. It is over 118,000 square feet, covers three acres of land, and can accommodate up to 450 performers on stage. The central chandelier weighs over six tons. Yet the auditorium seats only 2200 patrons. Of its seventeen stories, three are underground, contributing to the opera house’s mystique. These underground chambers served as inspiration for Gaston Leroux’s “The Phantom of the Opera” which was later turned into Andrew Lloyd Webber’s famous musical. A show in this grand house is an unforgettable event. We invite your imagination to travel to the City of Lights to experience the monumental and mysterious opulence of The Paris Opera House.